Click on an Item Above to Select Product. Fingerweaving is a method of weaving that is done without a loom. 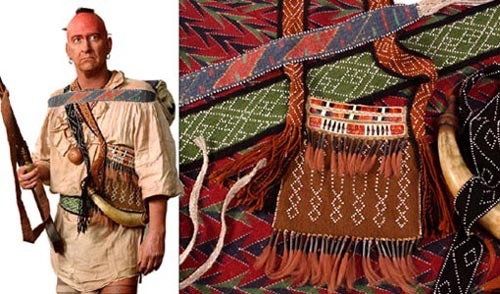 Whether oblique woven, warpfaced or twined the strands are not stretched between two points as they are in what we think of as traditional weaving. In warpface weaving all that is seen is the "warp" or stationary strands. The color and arrangement of these strands determines the pattern. Oblique weaving is a type of weaving known as "open faced", that is you see both the "warp" and "weft" strands. In the pieces I re-create using this method, the introduction of white beads is used to create geometric patterns. In some pieces contrasting colors of yarn are used create stripes that run the length of the work. The resist dyed pieces are woven using white, and sometimes white and black yarns and then dyed with natural dyes to create the main color and cross bands of lighter color. On other pieces the lighter, or different colored areas, are created by "reducing" or "bleaching" the main color to achieve the desired effect. Bags, straps, sashes or garters, whether reproducing original pieces or producing items of my own design, every attempt is made to recreate the look and feel of this ancient art. The tumplines I make have a twined center portion and oblique woven tails for tying the load. Twining is done using two "wefts' which cross each other as they pass thru the "warps". The design, if there is one is determined by the weft threads rather than the warp, as in some other weaves. I make my tumplines with hemp fiber, often adapting designs from 18th century pieces that were done by wrapping dyed moosehair around the weft threads to create a pattern. Other burdenstraps are woven using only two colors to create simple patterns. To see new and currently available items please go to the New Items. For custom orders please contact me by telephone or email. With all custom orders I am happy to work with the customer on colors and patterns or to work from original pieces they may have images of. Because prices vary according to the size of the item and materials used please contact me for further information.